Rather you're turning 60 or celebrating an anniversary, these colorful 60 whirls are a must. Simply hang from the ceiling, tables or walls and they'll be sure to add some color to your party. The package contains 5 whirls, each measuring 36 inches in length. A string is attached for easy hanging. 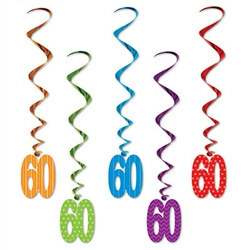 Make sure to check out our other 60 items to go with your party.